The latest poll has been concluded and I have to say that the overall results do not surprise me, but I am stunned to see that so many still believe Disclosure is at hand. I don’t know if these votes were cast by the same people who voted that way last time and didn’t bother to read the analysis or if they are simply that clueless. As everyone can see, the majority of the 192 votes (58 or 30%) were cast by those who believe there is nothing to disclose. 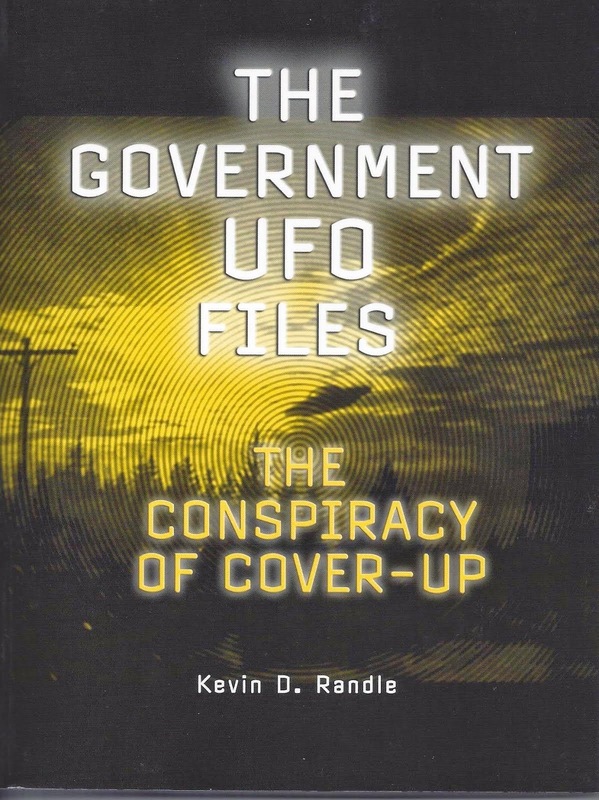 This suggests we might have a nice mix of skeptics who visit the blog, and those who believe the government has been honest in its reporting on UFOs. Over on the Magonia blog, the majority, 61% (47) votes, were cast by those who believe there is nothing to disclose. I think that addresses the difference in the average readers there. More of their readers are skeptical and maybe leaning toward the debunking end of the scale. Magonia voters didn’t have a chance to vote for “Not for Years.” Fifty-two people (27%) suggested that it wouldn’t be for years here. I had a category of “Never, but They Know) which received 34 votes or 17% of the total. Magonia had a similar category of “They Know but Won’t Tell Us,” which got 17 votes or 19%. We both had a “It’s Coming,” category. Twenty-seven (14%) thought it was coming sometime in the future. At Magonia, it was simply labeled “Sometime,” and received 17 votes or 19%. I had a category of “Disclosure is at Hand,” that received 21 votes, or 10%. Anyone who has been around the UFO field for a while knows, as I pointed out last time, that rumors of Disclosure have been around for nearly as long as the public interest in UFOs. The first rumor of Disclosure that I know of was the one swirling around The Day the Earth Stood Still (no, the good one in 1950 and not the latest one that sucked all the charm, wit, and intelligence from the movie). Disclosure didn’t happen in 1950 and it is not going to happen now unless something radically changes. That change could be the landing of an alien craft that can’t be denied, hidden or covered-up. It would be a world event that would require the governments to acknowledge that aliens are here. Until the aliens, if they are visiting, decide to announce it, I don’t see our government making any change in its policies. What we learned in this poll was that on both sites (and both sides of the ocean) the largest number of voters agreed that there was nothing to disclose. My majority was half of that at Magonia. Interestingly the “Never, but They Know,” category over at Magonia commanded at larger percentage than it did over here... that is 19% to 17%, but then I have five categories to their three. The bottom line seems to be that the majority of the voters don’t believe there will be any sort of Disclosure, either because there is nothing to disclose, or that the government is not inclined to disclose any time in the near future. All of this suggests that those suggesting Disclosure is at Hand have failed to convince the majority of the people that such is the case. It might be that they have failed to make a case for Disclosure is at Hand, or we all are so aware of what is happening, we know that Disclosure will not be coming. Either way, the poll suggests it won’t happen for a long time if ever. There has been a rumor circulating about the success of Project Mogul. It has been said that Mogul did detect some American atomic testing and it was successful in detecting the first Soviet nuclear test on August 29,1949. I have, in the past, read through all the massive information published about Mogul and the tests. My interest, naturally, centered around the June and July, 1947 flights in New Mexico. These are at the heart of the Roswell controversy. From all that I had read or seen, Mogul was never deployed. It was too expensive and wasn’t all that reliable, though in later years they were very successful on some very, long-range flights. I also believed that the first Soviet nuclear test had been detected through atmospheric monitoring and seismic recordings. Radiation from the test drifted over monitoring stations and the seismic readings allowed intelligence agents (well, the scientists who monitored such things) to pinpoint the location. I found nothing about Mogul being used. Tony Bragalia in an email to me, mentioned that Mogul had been successful in detecting that first Soviet test. I asked for the source and he pointed me to an Internet report by Richard A. Muller, who is a professor of physics at the University of California at Berkeley. I emailed Dr. Muller and frankly, expected no response. I mean the guy has published books, does television shows and teaches classes. His website is quite complex and interesting. I figured that he would be too busy to answer my question about the source and I was afraid my name might annoy him. I am, after all, on the other side of the debate. Dr. Muller responded within a couple of hours, and given the time (early morning) I sent my email, I was surprised. He was quite courteous in his reply, and supplied what information he could. He wrote, "I am afraid that I don’t have a hard source for that information; it was something that I was told, and I’m not sure by whom... I don’t have a hard reference for that. Sorry." In the grand scope of Roswell research, this means very little. Even if Mogul had eventually worked, it doesn’t change what people believe about the Roswell case. All this does is suggest that reports of Mogul success are little more than rumors. If someone has better information than this, I’m sure that he or she will let me know. But, until we can verify it, the fact is that there is no hard source for the suggestion that Mogul worked (which means in this context, that it didn’t detected the Soviet test). What in the world has happened to journalism in this country? Over the last weekend (15 – 16 April 2011) there was quite a stir about an FBI document (seen below) that some had found on a web site that posted a bunch of FBI documents. 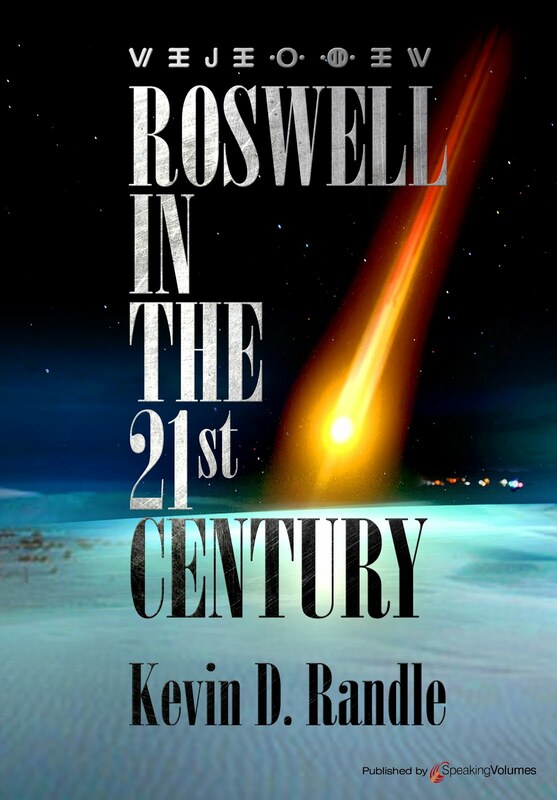 This one concerned a crash of a UFO in New Mexico with the recovery of alien bodies. Except those of us who have been in the UFO field for more than twenty minutes already had copies of the documents. I found them last century and when I say I found them, it was in a package of documents that the FBI had released to Dr. Bruce Maccabee in response to one of his FOIA requests. He, through the Fund for UFO Research, provided many of us with copies of the documents. The document, with a subject of "FLYING SAUCERS, INFORMATION CONCERNING," (who developed this style for subject lines in government communications anyway) said, "An investigator for the Air Forces [sic] stated that three so-called flying saucers had been recovered in New Mexico. They were described as being circular in shape with raised centers, approximately 50 feet in diameter. Each one was occupied by three bodies of human shape but only 3 feet tall, dressed in metallic cloth of a very fine texture. Each body was bandaged in a manner similar to the blackout suits used by speed flyers and test pilots." 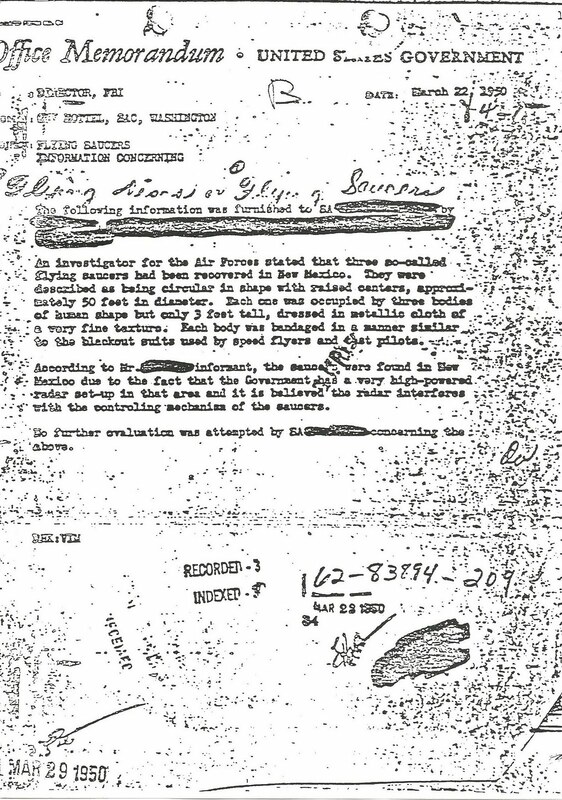 The important clue in this document, which the journalists didn’t find and didn’t understand was, "According to Mr. (Redacted) informant, the saucers were found in New Mexico due to the fact that the Government has a very high-powered radar set-up in that area and it is believed the radar interferes with the controling mechanics of the saucers." The consensus of UFO researchers is that the information came from Frank Scully who wrote Behind the Flying Saucers, about three UFO crashes, though only one was in New Mexico, and that the saucer had been brought down by radar. The journalists just didn’t know the history of this information and didn’t bother to check. Scully reported on three crashes. The one in New Mexico and two in Arizona. Originally, he reported on one in northern Africa, but that seemed to disappear from his writings in later versions of these events. Time magazine contained a story that was clearly the Aztec crash (from Scully) in January 1950. That might have inspired the tale given to the FBI. To make this worse, if possible. Some of those lazy journalists, who apparently didn’t bother to check with any of us who have been around for a while, added the MJ-12 Operations Manual to the mix. This document surfaced in the 1990s and again the consensus is that it is a fake. Yes, there are those who believe that manual to be authentic, but their arguments are weak. That is a debate that we’ll hold off until another time. In the end, we have a sudden spike in interest in documents that have been around the UFO field for decades. The source of the original information is known and the events to which it refers have been identified. Very few believe it refers to real events. It seems the document was forwarded to the FBI as a matter of routine by an agent in Washington who had heard someone talking about this. The real question is why would the agent have done that? Hoover, as we know, was interested in UFOs, so maybe the agent believed it was something the director would want to know. At any rate, we know the importance of this document... It has none. Okay, he didn’t kill Pluto and I’m not sure this nonsense about planets and dwarf planets is worth much debate. In the 19th century we had Ceres as a planet and then the king of the asteroids and now a dwarf planet with Pluto, and with three other objects that are so far from the sun in it was only recently that they were found. My problem was his suggestion that there is nothing to UFOs because the government is lousy at keeping secrets. The thinking, I guess, is that if UFOs are extraterrestrial and the government knows it for whatever reason, why that information would have leaked long ago. I’m not sure why he, and so many others, believe this nonsense, but clearly he does. Has the government kept secrets? Here is the conundrum. If it can keep secrets, then we wouldn’t know because the secrets would be, well, secret. How do we know if it has successfully kept secrets? I suppose we could look at the track record. We know about the Tuskegee Syphilis study only after it had been going on for forty years. A whistle blower provided two newspapers with the information which led to the end of the study. I’m not going to comment on the ethics of something like this, other to say I am horrified by it. Yes, you say, they kept the secret for forty years, but it did come out. Only shows that some secrets are kept for a long time. Then I could mention Operation Solo, which I have addressed before. This was an FBI operation that put a spy into the top reaches of the Soviet government. Morris Childs was a leader of the American communist party in the 1930s until he became disillusioned with it. Cooperating with the FBI, Childs maintained his association with the communists in the Soviet Union, becoming a trusted communist. He was so highly respected that they shared many of their secrets with him... and sometimes shared secrets they didn’t know they were sharing because they didn’t know he spoke Russian. This operation was so secret that others working in the FBI office in New York which oversaw Childs didn’t know about it unless they were directly involved. It was so secret that presidents were not briefed on it. The only exception was right after Gerald Ford became president and he was to meet with Soviet officials. The FBI told him the source of their information to boost his confidence in his dealings with the Soviets. This operation ran from the 1930s to the 1990s when Childs retired and the Soviet Union collapsed. 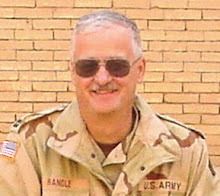 Only then was he recognized for his contribution to the United States, after there was no longer a need for the secrecy and there was no longer a danger to him. This proves that secrets can be kept. So, to Dr. Tyson, I say, one of your reasons for rejecting the notion of UFOs is invalid. As for Roswell, I would say, the secret hasn’t been kept. We are talking about it. People have come forward, credible people, to tell us what they saw. It’s just that those editors of newspapers, which would jump at the chance to expose another government secret do not believe that there has been alien visitation and since they don’t believe, they are not going to listen to anyone who suggests otherwise. Oh, I know that we have let this get away from us. We had to put up with the contactees who told of visits to the other planets of the solar system, talking of environments that we know now do not exist. We have been the victims of hoaxes. Nearly every photograph ever taken of a UFO has turned out to be a hoax. And we have had Roswell witnesses who were once respected but who are no longer considered credible. And we have had the Air Force providing explanations that are preposterous but people believe them because it is easier to accept these answers than suggest something alien has visited. I would throw out the Mogul explanation right here because anyone who looks at it rationally realizes that it doesn’t fit the facts. But there are many people who believe it anyway. Alien visitation is, you might say, a self–keeping secret. It is such an astonishing secret that people just refuse to believe it. I tell you about a UFO crash and you just cannot accept that such a thing has happened so you don’t bother to look into it... or invent reasons to reject it. In the end, all I can say to Dr. Tyson is one of your expressed reasons for rejecting alien visitation is invalid. With that eliminated, maybe we should move the discussion to the evidence that does exist and not the speculation that interstellar travel is impossible. Maybe we should all look at the evidence. I was reading an article by John A. Johnson in the latest Sky & Telescope (which suggests something about my eclectic interests) and was struck by his opening comments. He suggested that an alien astronomer searching for Jupiter-like planets would not be inclined to look at our solar system. And, he mentioned that if you were searching for small, rocky planets, then you would be more likely to find those orbiting dwarf stars. What has this to do with us, you might ask. Glad you did. See, back in the 1970s Marjorie Fish, in attempting to find the star system from which the abductors of Barney and Betty Hill originated, made a model of our section of the galaxy. She assumed, and I’m not sure that it was a bad assumption at that time, that those aliens’ home world would be close to us, galactically speaking. They probably didn’t come from a world across the galaxy, though when we begin to speak of interstellar flight, we really have nothing on which to base our assumptions. Once you have solved the problems of interstellar travel, the distances, however great, might not mean all that much. We just don’t know. When Fish put together her model, she ignored the red dwarf stars because there were so many of them in the vicinity of Earth and they probably didn’t have anything interesting going on around them anyway. Astronomic thinking at that time suggested that dwarf stars wouldn’t have planetary systems. We now know there are planets circling many of these stars. What all this means, simply, is that the Fish model, and the conclusion that some of the aliens originate from Zeta I and Zeta II Reticuli has been superceded by better information. The evidence that suggested this is no longer accurate. Fish needed to include those dwarf stars in her models. Again, this isn’t a criticism of the work done by Fish. At the time she constructed her models and did her research, she had the best information available. In today’s world we know that some of her basic assumptions were wrong. And I haven’t even mentioned that the newest star catalogs have revised the distances to some of the stars that she did use and that earlier information has been found to be inaccurate. In other words, some of the stars that she included in her survey are now outside the parameters that Fish set. This means that we can no longer say, with any degree of certainty, with any degree of confidence, that the Zeta Reticuli system is the home of any alien race. Until this research is redone, we can no longer say that we know where some of the aliens originate. The evidence just is no longer there.